Your first look at Sled Island 2017 is here! Our stunning first wave of 2017 artists includes beloved metalcore pioneers Converge (who will perform an intimate show at the #1 Legion), noise-rock phenoms Cloud Nothings, raw indie-rock songwriter Waxahatchee (who will perform a special solo show at the Central United Church), minimalist indie-rock legends Low, influential electronic experimentalist Silver Apples, atmospheric black metal band Wolves in the Throne Room and folk-pop songwriter Weyes Blood. Ethiopian jazz great Hailu Mergia will make a stop at the festival, as well as grindcore band Daughters, recently-reformed and much-loved indie rock project Land of Talk (who return to Sled Island after a memorable show at the festival last year), avant-chamber ensemble Thor & Friends (the latest project of eye-popping percussionist and Sled Island alum Thor Harris), plus experimental metal band EX EYE (featuring avant-garde saxophonist and Sled Island alum Colin Stetson). 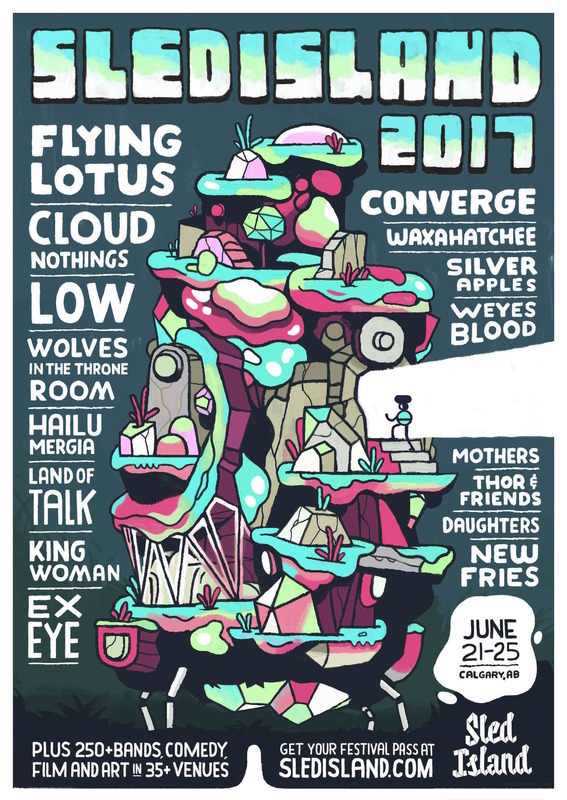 Additional bands joining the lineup include indie-folk group Mothers, intoxicating doom project King Woman and frenetic post-punk band New Fries. Last month, we were excited to announce visionary producer, rapper, DJ, label owner and filmmaker Flying Lotus as 2017 guest curator. Flying Lotus’ curatorial selections will be announced in the coming months, along with other festival acts, including additional headliners.